This article is 3265 days old. Another Roman Catholic church is slated for closure in Windsor. This time, St. Patrick’s, a church populated with a strong number of Italian Canadians parishioners south of the Bridgeview area in West Windsor, is set to be closed and up for sale in June. Fr. Michael Dwyer, on behalf of me, Fr. Jim Roche, is presenting to you the Recommendation I will be presenting to the Council of Priests on Tuesday, May 11th. The Recommendation is the same Recommendation that was presented in 2009 and one that has been on the burner since the beginning of the Parish Reorganization Program that started in 2005. “On March 4, 2009, the Episcopal Vicar of Windsor Deanery, the Windsor Deanery Executive and the Director of Pastoral Planning Services met to review the data collected concerning St. Patrick Parish and to place that data in conversation with the Parish Reorganization Policy Criteria. 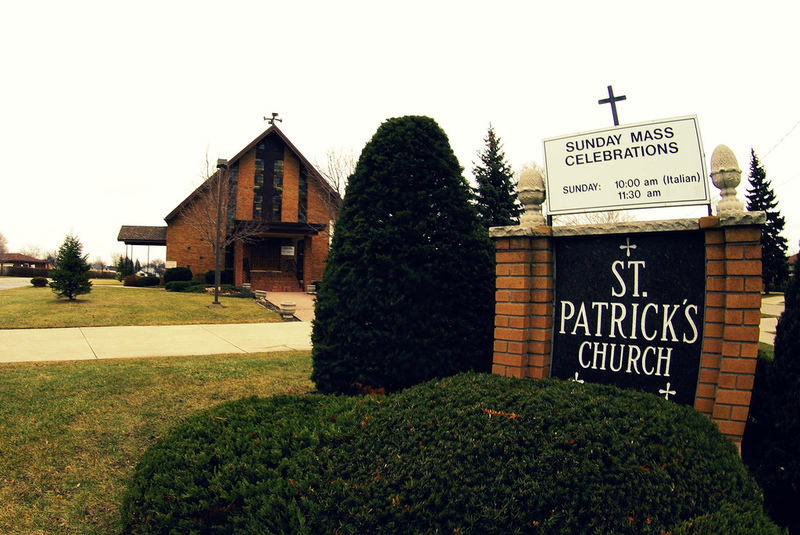 It is recommended that St. Patrick Parish, Windsor, close effective August 23, 2009 and that the boundaries of this parish be attached to Our Lady of the Assumption Parish. It is recommended that Italian speaking parishioners of St. Patrick Parish move to St. Angela Merici Parish, effective August 31, 2009. Please Note: At a Town Hall meeting February 15, 2009 at St. Patrick Parish, Bishop Fabbro invited the members of the Italian community to move to the Italian speaking parish of St. Angela Merici Parish where Mass is always available to be celebrated in the Italian language. In May of 2009, Fr. Jim Roche, Episcopal Vicar of Windsor Deanery and Connie Paré, Director of Pastoral Planning Services, presented these recommendations to Bishop Fabbro and the Council of Priests. The Council of Priests’ hesitancy to accept the 2009 Recommendation was based on the question of the neighbouring parishes of Assumption and Holy Name. Those questions have been responded to with the closure of Holy Name as a parish and having it joined as a worship space to Assumption. There was also the underlying factor of the Religious Education Program sponsored by the St. Patrick’s Community Association. There was an initial agreement to study that matter for six months; due to a communication glitch and the inability of the SPCA and the new pastor to meet, the SPCA met with the Pastor of Assumption and, subsequently, the SPCA Religion Program was transferred to the Assumption/West Windsor Catholic Assembly. That indeed was a major concern of mine. The process of “MOVIN’ ON” was being addressed by the local community and not by the hierarchal leadership of the Diocese. With that in mind and with the Deanery Executive approbation – I set out to make this one year extension a successful venture and so it has been. Next week we will be issuing a flyer with all the information that can be assessed of the three local parishes, all within a ten minute radius of St. Patrick Church. These are only a glimpse of the area Catholic Community. When the Recommendation is affirmed by the Council of Priests, the final Solemn Mass with Bishop Fabbro, has been planned for June 20th at 10:30 am followed by a reception. Be assured that when the Church is closed and sold, every effort will be made that the monies accrued will be transferred to Assumption Parish, especially to pay off the debt of the boiler of Holy Names so that Assumption does not have another debt to assume. None of the monies will be going to Corpus Christi. Thank you for your support during this past year. Fr. Dwyer and I wish to thank you for your respect and cooperation.